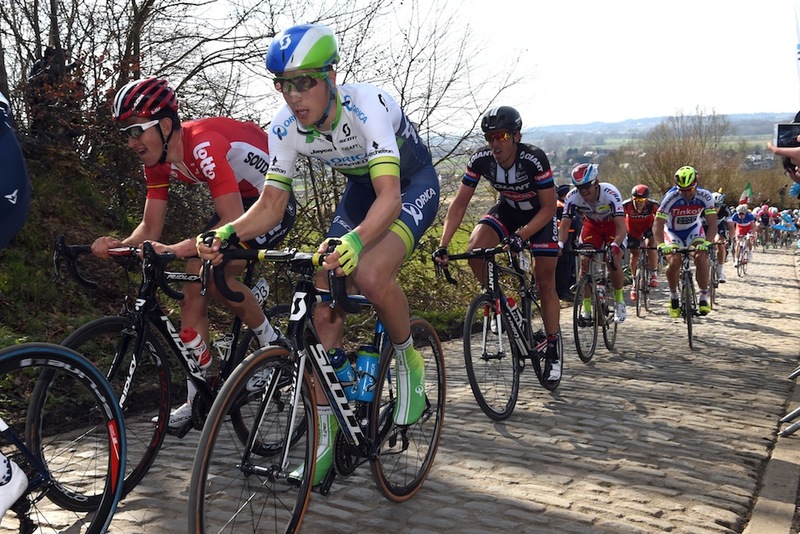 Cobbled Classics report card: Where does your team rank? The cobbled Classics are over for another year and while many teams will be able to sit back, content with their performances, many other will be going back to the drawing board. A win over the cobbles is a remarkable achievement on its own, but several teams have been there and thereabouts in these races without experiencing a visit to the top step of the podium. Now that all is said and done, we have compiled a school-style report card for each team, based on their performances and some other arbitrary criteria, giving them all a grade between A+ to D.
The races included in the marking are: Omloop Het Nieuwsblad, Kuurne-Brussels-Kuurne, E3 Harelbeke, Ghent-Wevelgem, Tour of Flanders, Scheldeprijs and Paris-Roubaix. See how your team fared below. It was a cobbled campaign to forget for the Boys in Brown, failing to obtain a single top-10 finish in any of the seven races. Canadian Hugo Houle was the French team’s top performer in the early races, but even then couldn’t break into the top-20. With former Paris-Roubaix winner Johan Vansummeren in their ranks, Ag2r will have been hoping for more than a cameo appearance by youngster Alexis Gougeard in the breakaway. Vansummeren himself finished well down in 75th after an early spill. While it’s been a barren run on the cobbles, Ag2r have had success elsewhere, with Domenico Pozzovivo taking a stage in Catalunya and Jean-Christophe Peraud winning at the Criterium International. It’s been an up-and-down campaign for the Kazakhstan squad, but two strong rides by Lars Boom, who won over the cobbles in the Tour de France last year, in the Tour of Flanders and Paris-Roubaix have given their results some respectability. Without the Dutchman, however, Astana failed to break the top-10 in any of the other races they entered, although sprinter Andrea Guardini could have contested the sprint at Scheldeprijs if he hadn’t caused the massive crash in the final straight. Close, but no cigar for BMC this spring. Greg van Avermaet was in contention in many of the races, but the pressure on him to win in his homeland was immense. 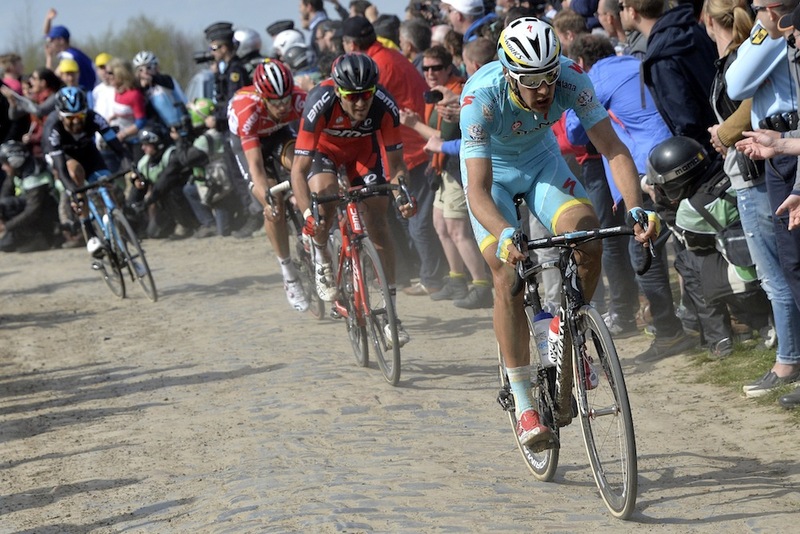 Even so, the Belgian notched a podium place in Flanders and went on to do the same in Roubaix the following Sunday. But while Van Avermaet remains the face of the team’s cobbled campaign, this spring has seen the emergence (or re-emergence) of Italian Daniel Oss, who proved he is a threat in any of these races. Oss found himself in the front group on numerous occasions and was on hand to liven up proceedings whenever the opportunity to attack arose. 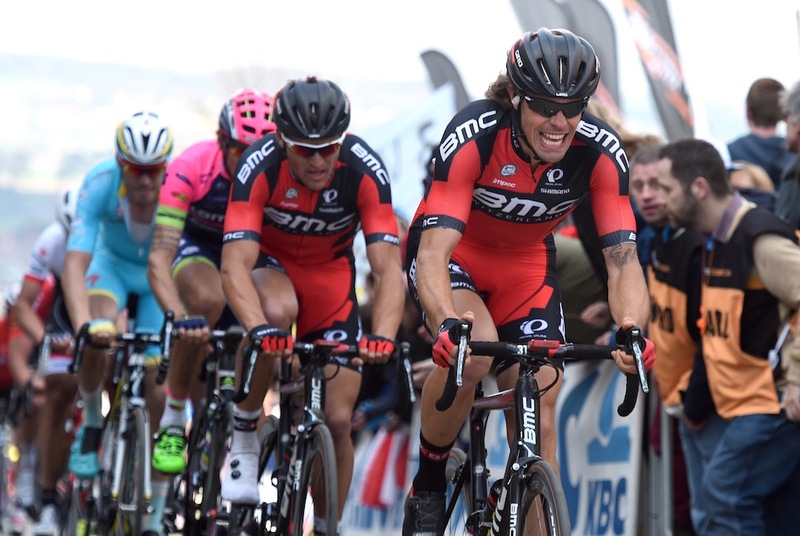 Finishing above Van Avermaet in both E3 and Ghent-Wevelgem, Oss showed that BMC are more than just a one-man team. It’s a shame that Cannondale’s campaign will be remembered for Jack Bauer’s bike throw at Ghent-Wevelgem, but it pretty much sums up the team’s performances on the cobbles. 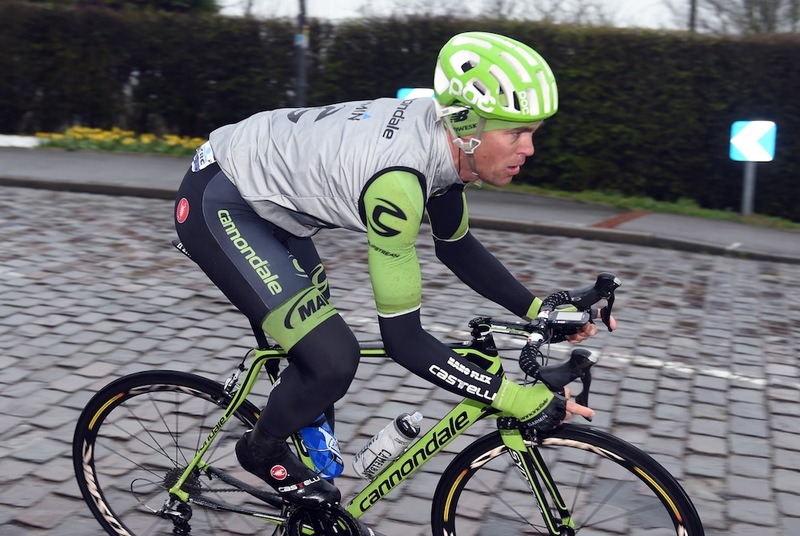 After sitting out Het Nieuwsblad and KBK, Cannondale started strongly with an eighth-place finish for Bauer at E3 Harelbeke. But that was about as good as it got. Always the bridesmaid, but only once were Etixx-Quick-Step the bride. Mark Cavendish’s win at KBK was the sole glory for the Belgian team in their home races, with a remarkable 12 other top-10 finishes on their resumé. 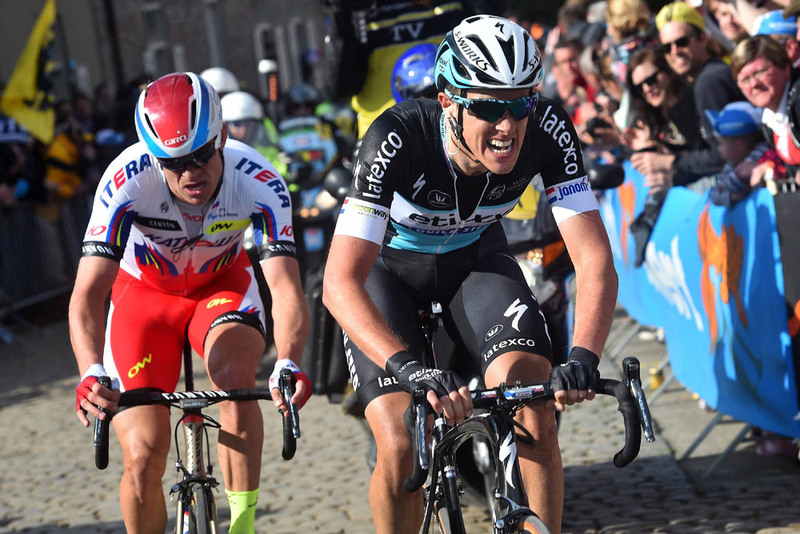 Five times Etixx finished second on the cobbles. Niki Terpstra was the unlucky man on three occasions (Het Nieuwsblad, Ghent-Wevelgem and Flanders), while Zdenek Stybar got the other two (E3 Harelbeke and Paris-Roubaix). Without Tom Boonen for the final four races, Etixx looked a bit at sea without a true leader and their tactics were questioned – especially after E3. But their remarkable consistency in all of the races means they deserve a decent grade. 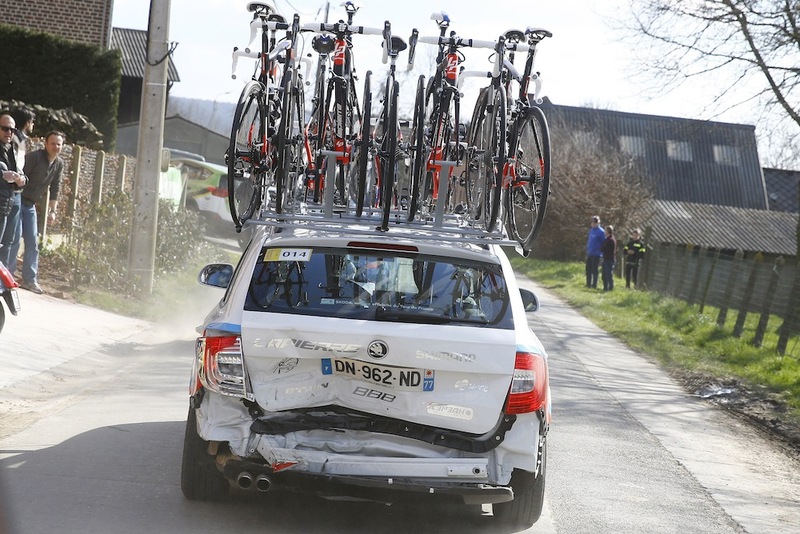 Much like with Bauer’s bike throw, FDJ’s cobbled campaign was very much summed up by the events of the Tour of Flanders, when a neutral service car rammed the back of the team’s Skoda. French champion Arnaud Démare was the French team’s best hope in many of the races and managed a series of decent finishes, without ever challenging for a win. The team of young riders will be focussed more on their performance at the Tour de France this summer than the cobbled Classics, but it was still quite a disappointing campaign. German team Giant-Alpecin have gone from being the perennial whipping boys to relentless contenders in the biggest races all year round. 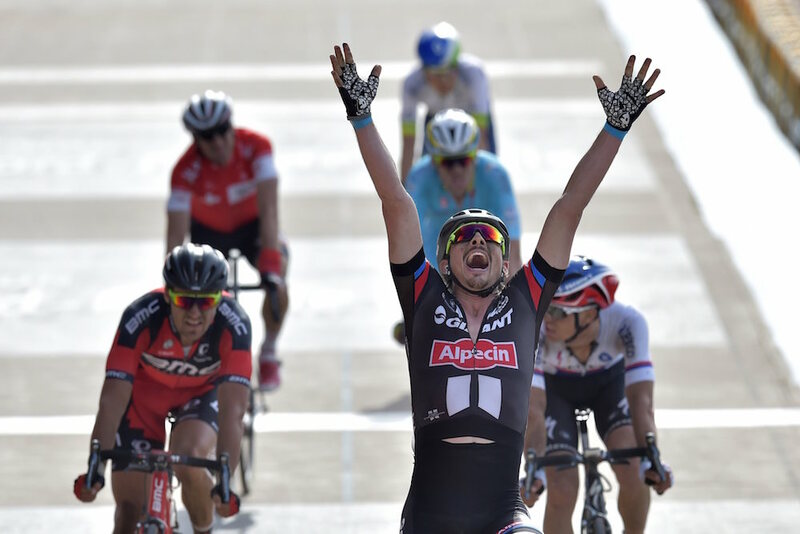 It’s been a spring to remember for John Degenkolb, who followed up his first monument win at Milan-San Remo with a mighty impressive victory in Roubaix. Seventh in Flanders showed that Degenkolb had carried his form from San Remo and the win in Roubaix was enough to dismiss the team’s virtual anonymity in the early cobbled races. For their first year in the WorldTour, IAM Cycling should be pretty happy with their solid cobbled campaign. Three top-10 finishes, including two from Martin Elmiger at Flanders and Roubaix, showed us the team is packed with talent. Veteran Classics man Sylvain Chavanel was on hand to lead the team home in E3 and Ghent-Wevelgem – even if he did struggle to take his jacket off. If you were to end the season now, Katusha would likely be pretty satisfied with their haul. Three wins on the cobbles is a great achievement on its own, but the way the two big ones were won is pretty special. 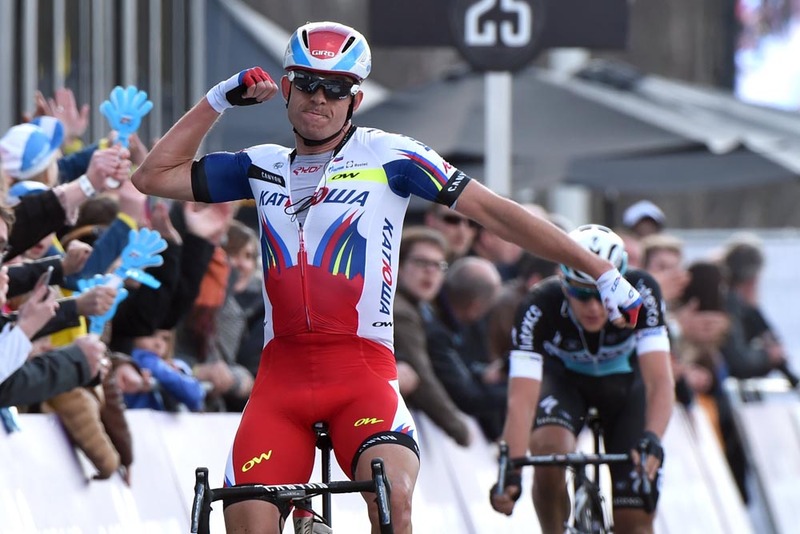 Kristoff out-foxed and out-gunned Niki Terpstra in a two-man breakaway in Flanders, while veteran Luca Paolini defied the odds and the horrendous weather to take Ghent-Wevelgem. Add to that Kristoff’s overall win at the Three Days of De Panne and Scheldeprijs, plus the Norwegian’s stellar results at Het Nieuwsblad (11th), KBK (2nd), E3 (4th) and Paris-Roubaix (10th) and you get a pretty successful few months for the Russians. So irrelevant were Lampre-Merida in the cobbled Classics, the above picture of Nelson Oliveira is the only one of the team in the Cycling Weekly archives. Granted, they were dealt a blow when Filippo Pozzato was forced to pull out of E3 and Ghent-Wevelgem with illness, but without him the pink team were conspicuous by their absence. Pozzato returned to post 12th place in Flanders, but followed it up with 65th in Roubaix – just four places below their highest finisher, Oliveira. Belgian Sep Vanmarcke went into his home races with the weight of expectation on his shoulders, but a combination of bad luck and bad timing made for a frustrating campaign. Vanmarcke notched top-10s at Het Nieuwsblad, E3 and Ghent-Wevelgem, but was nowhere to be seen in Flanders – a race that he was the bookies’ favourite to win. Then, a puncture at an inopportune moment in Paris-Roubaix left him too much work to do in the finale and rolled over the finish line in 11th. The bumblebees remain the only WorldTour team without a win in 2015, and perhaps their best chances of glory have passed them by. Every time you switched on the TV to watch one of the cobbled races it’s likely you will have seen a Lotto-Soudal rider at the front of the pack. The Belgians were relentless in their desires to shake up the races, laying attack after attack, but all to no avail. 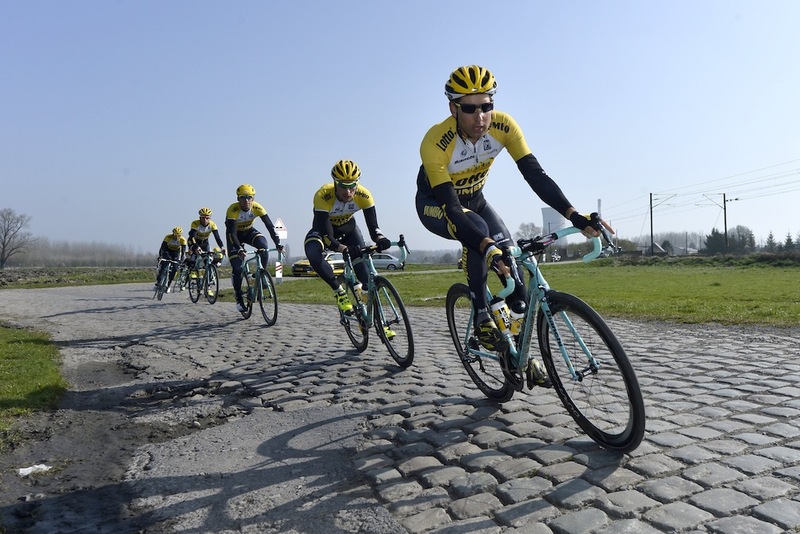 Their strength was the sheer number of riders they have who can feature in the cobbled races. Belgian champion Jens Debusschere came of age with top-10s at KBK, Ghent-Wevelgem and Paris-Roubaix, while Jurgen Roelandts looked as if he may take a remarkable solo win in Wevelgem. Then there was Andre Greipel, whose attacking instincts in Flanders helped Tiesj Benoot and Roelandts finish fifth and eighth respectively. 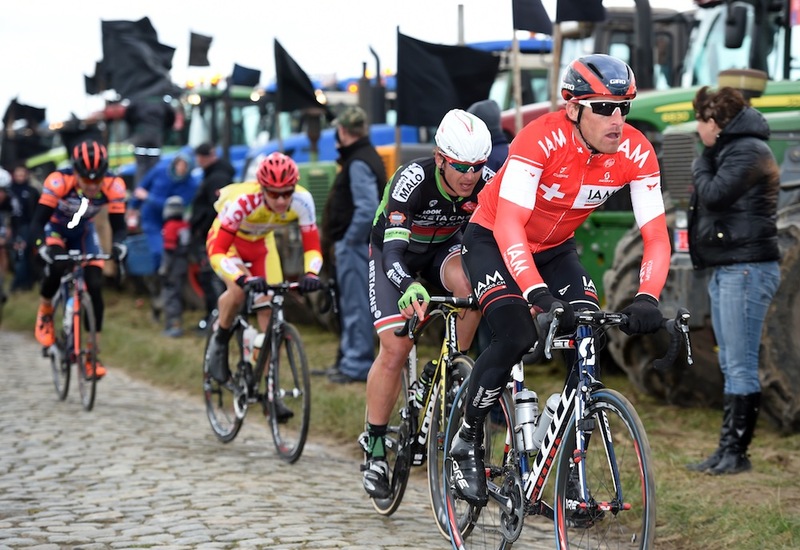 The huge German grabbed himself 15th at Flanders, having never broken the top-50 in his previous attempts. The cobbled Classics are clearly not a goal for Movistar and their results summed that up pretty well. 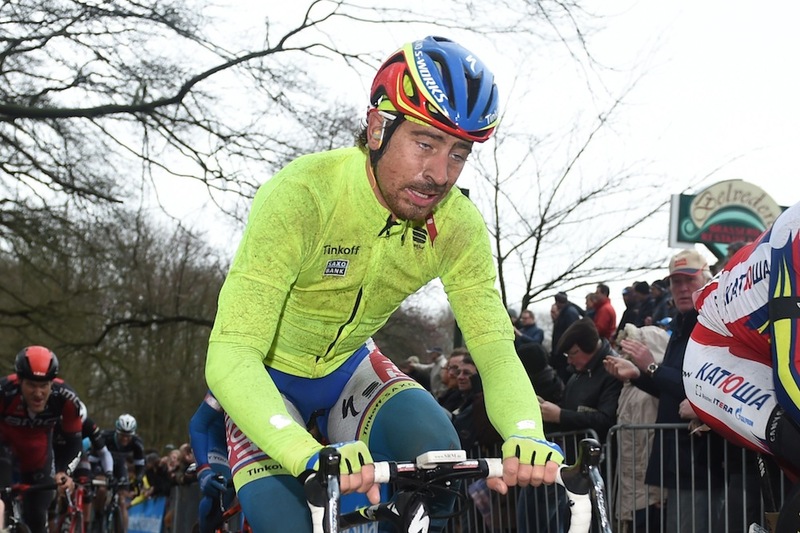 It was a terrible campaign for the Spanish team, with Juan Jose Lobato’s gutsy ride in Wevelgem the only exception. Movistar seemed to use these races to get their riders on form for the rest of the season. Nairo Quintana raced E3 to get used to the cobbles which will feature in the Tour de France, while Alex Dowsett looked thoroughly miserable to continue his injury rehab in Wevelgem. A new star may have been born at Orica-GreenEdge, even though Jens Keukeleire is actually 26 (despite his boyish looks). 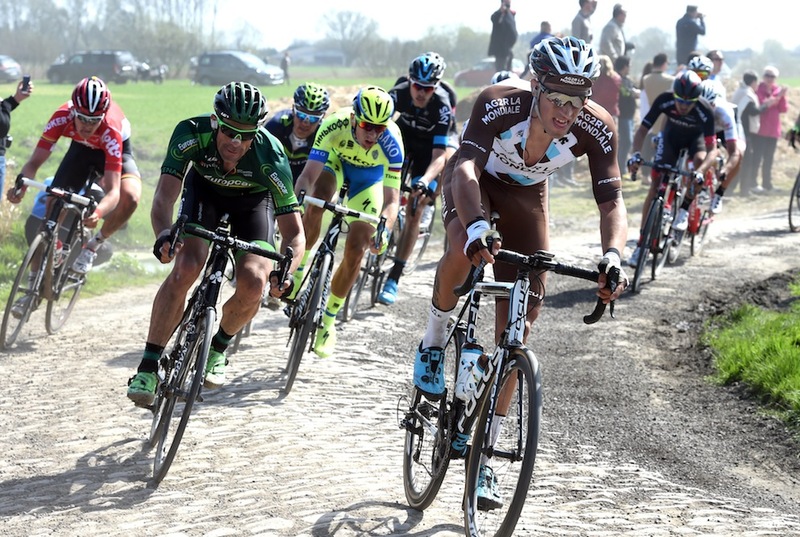 The Belgian on the Australian team took ninth in E3 and put in a great ride in Paris-Roubaix to finish sixth. The youngster has the benefit of a dedicated team behind him, as well as an excellent foil in Mathew Hayman, who had a few eyes on him in the bigger races. 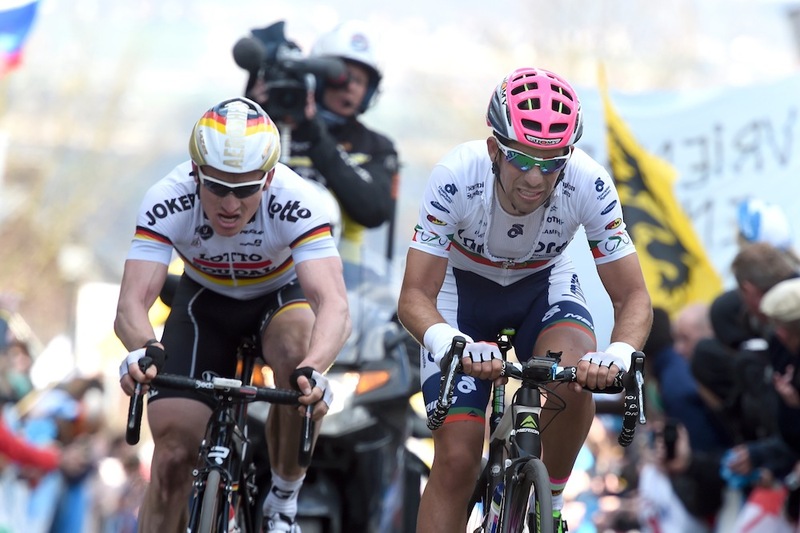 Promising signs for Orica-GreenEdge, but their season will now kick off in earnest with the Ardennes Classics and the Tour de France. 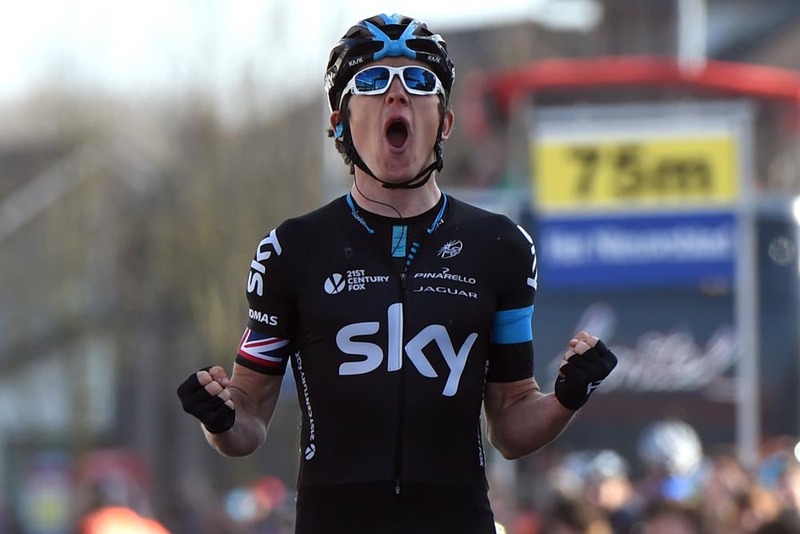 After years of promise, Geraint Thomas finally made his breakthrough at E3 Harelbeke, taking a fine solo win. After that, however, the Welshman was a marked man and couldn’t quite repeat the feat. A solid ride in Wevelgem was followed by a challenging time in Flanders when no-one wanted to help him bridge the gap on Kristoff and Terpstra. Luke Rowe really came of age for the British team with some great rides for the team, and was Sky’s highest finisher in Roubaix with a great eighth place. Sir Bradley Wiggins’ fairytale ending wasn’t to be, but he, and Team Sky, can certainly hold their heads high after a standout campaign. The above picture sums up Peter Sagan’s campaign well. Oleg Tinkov splased big money on the Slovak for exactly these races, but the 25-year-old could not live up to his billing. With all eyes on him, Sagan was a marked man from day one, but even then he has been well below his best all season. He ran out of gas in E3 when chasing Thomas and Stybar and was left thwacking his left brake lever in Paris-Roubaix as his bike turned against him. Fourth place in Flanders was the best it got for him, but for someone earning so much dollar, it’s not really enough to justify that price tag. Trek’s chances of glory ended just 39km into their campaign. 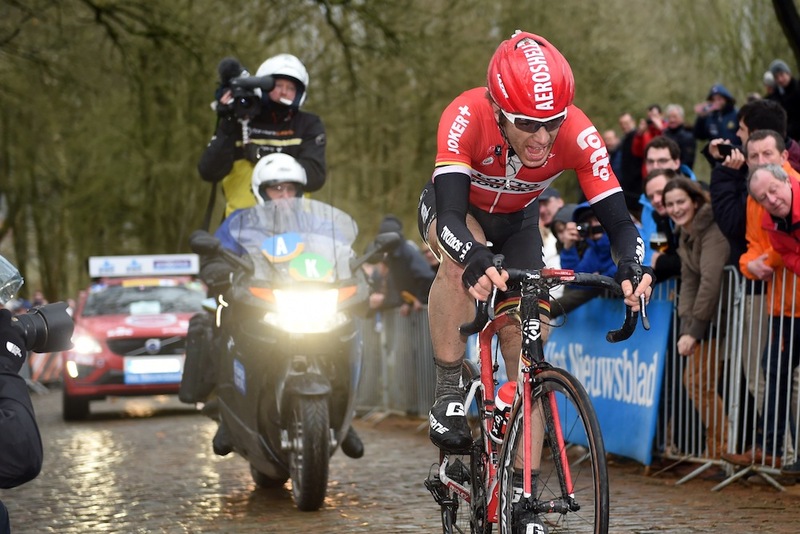 Having sat out Het Nieuwsblad and KBK, Fabian Cancellara and co started at E3 Harelbeke with such high expectations. Then, on the Haaghoek section of cobbles less than an hour into the race, the Swiss took a tumble, broke his back and left Trek reeling. 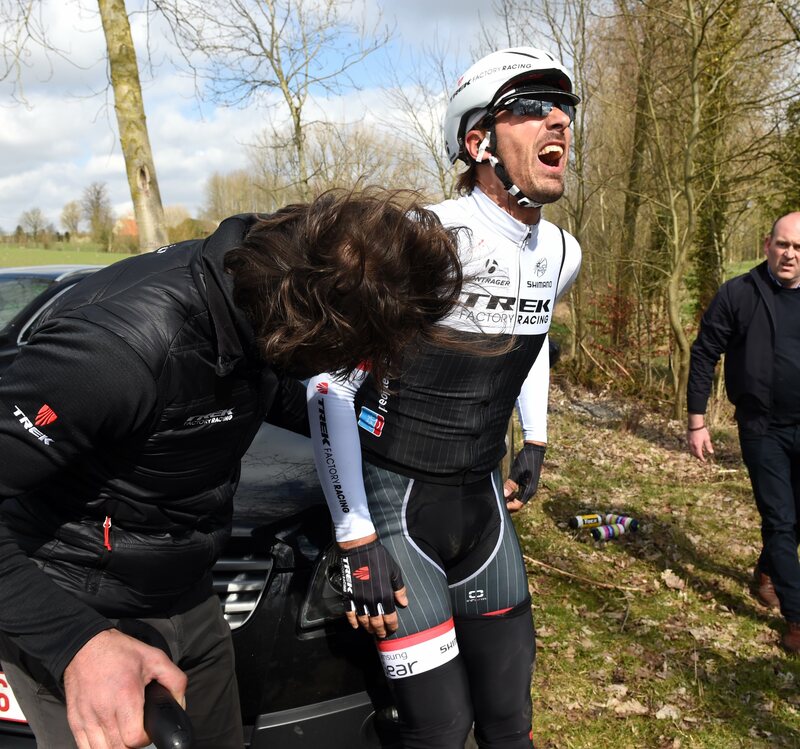 If that wasn’t bad enough, Jesse Sergent was taken out by a neutral service car in Flanders, while Cancellara’s stand-in – Stijn Devolder – crashed out of Paris-Roubaix after 13th place the previous week.